Deputy Chief Designer of KMDB, Head of Advanced Design. It is very likely that in addition to automating some of the functions of the tank crew, organizational measures and a revision of outdated views and ideas will be required. Field of care for health reasons from the post A.A. Morozov were two candidates - N.A. Shomin and E.A. Morozov. From May 1976 to May 1990 N.A. Shomin headed the Kharkov tank design bureau. Some issues of creating a promising tank of the 80s are described in the book by Yu. M. Apukhtin (designer if the future Soviet tank advanced Information and fire control systems) book THE LAST CHARGE OF SOVIET TANK BUILDERS - diary of the participant of the development of the Boxer tank (in Russian). 11.07.80. Voronin came to see our future tank project, Anishchenko, Chubarenko, Rachitsky and others were with him. Morozov was on vacation. Two options were reported: Mazurenko with a crew of two people and Kovalyukh with a crew of three people, with a new 130 mm gun made, gunner and commander to the left of the gun. In their areas reported all the deputies. Slovikovskiy reported on the management complex; I attended the report of Slovikovskiy (I was at a meeting of a such level for the first time). It was felt that Voronin was trying to figure out and evaluate the options. Surprisingly, Slovikovsky reported very well, which Voronin noted. My materials on the analysis of controls and control options for two and three people were successfully presented. In general, Voronin reacted positively to the complex. The most amazing thing is that everyone supported a crew of two man crew, which means that no one even tried to dispute it. 1:10 early wooden model of three-man variant of future soviet tank “Object 490”. End of 1970-s, ~ 1979. 25-26.03.82. We had a Council of Chief Designers on the choice of a variant of the “Topol”, there were almost all the first persons. Considered two options, the majority was in favor of the Kovalyuh’s variant (3-man). Morozov reported poorly and it was felt that his version was crude. At the end, Shomin spoke and said that he was two people in his heart, but the question of controlling the tank was practically hard, so he could not go for this option. Accepted Kovaluh’s variant. 1:10 wooden model of three-man variant of future soviet tank “Object 490A”. 1:1 wooden model was built in 1983, later 2 prototypes were build and tested. 9.12.82. At our call from Novosibirsk came Blinov and Karmanov. They were invited by Evgeny Morozov for the variant of the sighting system with two crew members. According to their conversation, I realized that they were willing to work, but they would only do the instruments, not the complex. 13.01.86. Upon arrival from Moscow, I was informed about the signing of the order for my appointment as the head of the department, despite my attempts, Isaev did not want to give up the department of optical instruments. The design bureau is divided in half. I was practically equaled with Isaev, but the Poles and Isaev do not allow me to solve organizational problems. Morozov was removed, Kovalyukh became the chief designer of the new tank project. The design bureau is in a state of ferment, where and where they will be appointed, the work in connection with these events has been suspended. But it is worth mentioning that work on a promising tank with a crew of 2 people "Object 490", as well as its development went up to the death of Eugenie Morozov in 1991 in parallel with the projects “490A” and “477”. This works resulted into evolution of the 2-man tank conception to mature conception which was halted only by the collapse of the Soviet Union in 1991 (as well as the beginning of the end of it’s competitors). Rainer Glas and Rolf Hilmes Shaping Germany’s Leopard 2 tank for the Future. International Defense Review, 1995. Scott Gourley. Latest Future Combat System Plan Unveiled. Jane's Defence Weekly, 2 July 1997, р. 26-28. (Hans-Dieter Roth. Systemtechnische Umsetzung Neuer Technologien bei Kampffahrzeugen Schlüsseltechnologien für das Heer, 2001, S. 15-17). At the dawn of the tank era, no one could imagine a tank with a crew of four or five people, in those days they could not do without a dozen. But these times are long forgotten. 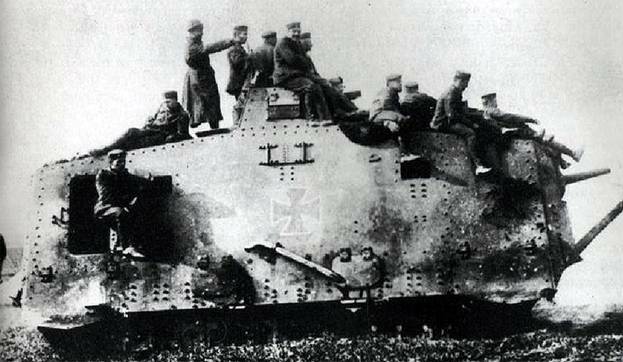 Reduction of the crew to two people and placing them in a compact, well-protected capsule with automation of the functions performed by tank men. The principal possibility of controlling the shooting and movement of two operators does not cause doubts. Both workplaces were equipped with a similar set of instruments and tank controls that ensured full duplication of functions by crew members. Each workplace was completed with 2 monitors, a unified fire and motion control panel. Starting with the 2nd version of the layout, the rate was placed on the use of promising solutions for providing visibility and information transfer – fiber-optic connections, digital central computer system, television cameras. "Object 490" late design variant. Hatching shows the placement of ammunition and fuel. This general layout is similar for other design options of this project. Driving control was supposed to be carried out with the help of a stereoscopic television driving system (STV) installed in the front part of the hull. For reverse driving, the television camera was also located on the aft of the hull. Movement back at a speed of up to 30 km/h can significantly increase maneuverability and survivability, eliminating possibility of shelling of the rear of the tank on the battlefield. The static visibility was carried out using 8 daytime devices with a light-fiber connection. The system provided a 360 ° view for each of the tankers without overlapping the view with elements of the product architecture installed on the turret (there were no blind areas). The installation of such devices also eliminated the weakening of armor and radiation protection caused by cutouts in the roof, necessary for the installation of periscopic vision devices. Additionally, the television camera was supposed to be installed on the air feed tube (OPVT), which greatly simplifies underwater driving. The use of the camera was assumed when moving in a column, when the visibility drops sharply from the dust of the tanks in front. In addition, the intake of air for the engine through the air supply pipe from the upper, less dusty layers can increase the engine's life. Raising the air supply pipe on the “490” did not require the crew to leave the tank and could be carried out automatically. Television camera on the left (in the course of the tank) track shoulder. The air supply tube with a television camera is placed behind the tank turret, which not only simplifies underwater driving, but also allows movement in a convoy and observation of the targets by hidden terrain. 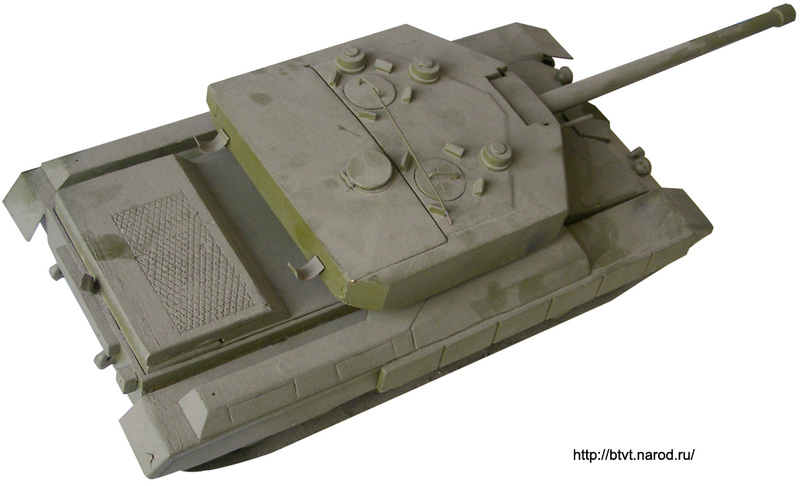 Significant attention in creating the “Object 490” was paid to the density of the layout (avoiding laying torsions over the tank bottom, optimizing the shape and overall dimensions of the equipment placed in the tank), reducing the weight and dimensions and increasing the survivability of the tank. It was supposed without weight gain (Variant 1 and 2 - 41,500 kg) and dimensions to create a tank with a significant increase in combat qualities. This can not be achieved only by increasing the LOS and weight of the armor. Therefore, along with the use of the latest achievements in the field of armor technologies and active protection systems (APS), the frontal fuel tanks are included in the tank protection scheme, which makes it possible to sacrifice (part of the fuel) secondary criteria for the implementation of the most important ones - crew survival and preservation of tank mobility. Not resolved remained a number of issues related to maintenance of the vehicle with a crew of two people, the issue of command and control of the unit by commander-shooter in the case of a commander tank. 2.06.80. Morozov suddenly demanded, on Shomin's orders, for two weeks to submit materials on the crew of two and three people and the rationale of a two-person crew. It is necessary to force this work with Didorenko. When conversations about the layout of a tank with a crew of two people began, I became interested in the crew’s ability to control the tank while building up and complicating its systems and, on its own initiative, began analyzing the workload of the crew of a serial production tank. Nobody has done such work before us and I instructed Didorenko to collect information on the specialized departments of the design bureau on the controls and the functional load of the crew members. By that time, we began to receive classified information on ergonomics in military technology, including the loading of the crew of the Soyuz spacecraft. When we collected all the controls of the crew members, it turned out that there were more of them than on the Soyuz spacecraft. If for flying on it for many years officers with the rank of colonel have been trained, the tank crew consists mainly of 18-20-year-old soldiers, and this in further work made me take the development of control panels very seriously. Shomin found out about my initiative work and became interested in it, the choice of the layout of the tank with two and three-man crew was based mainly on the findings of our work. Lower row: from left to right: E.A. 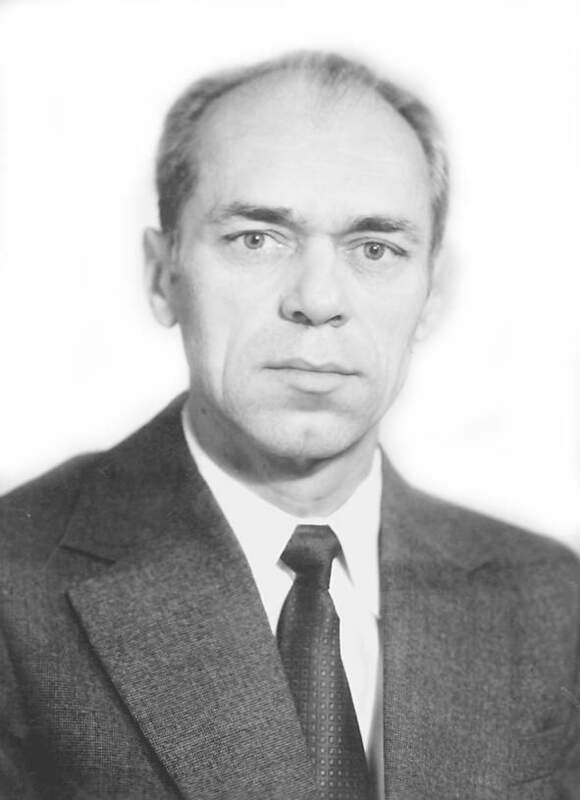 Morozov, D.A. Shestak (Head of Experimental Base), N.A. 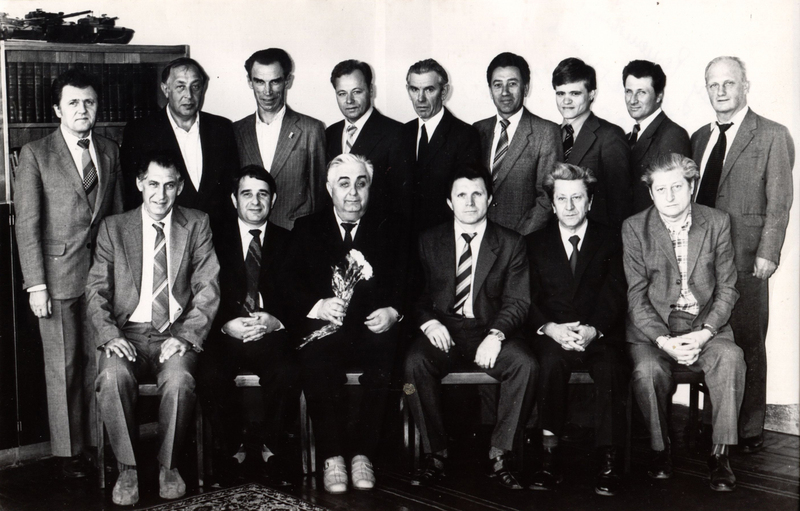 Shomin, A.A. Abramov, A.M. Kretov (secretary of the party Bureau of the KMDB). Second row: A.G. Slovikovsky, A.V. Bershov, B.N. Polyakov, V.V. 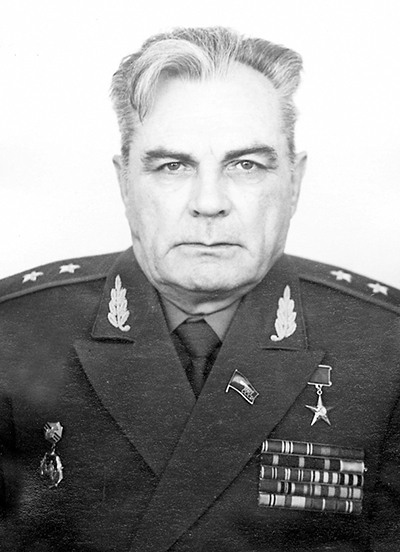 Tsarev, A.V. Nosal (chairman of the trade union committee), V.V. Isaev, M.Ya. Baisov (Head of Perspective Design Department). Lower row: Protopopov, I.L., Kovalyukh, V.R., Abramov, A.A., Kretov, A.M., Gerasimov, V.N., Portnoy, V.Ya. 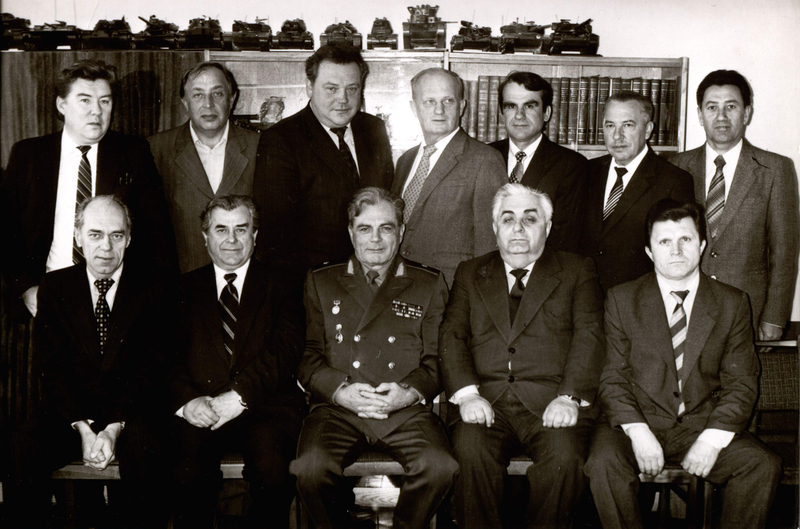 Top row: Gnedash N.F., Bershov A.V., Pivnev A.I., Zavadsky A.M., Sakharov M.I., Baisov M.Ya., Apukhtin Yu.M., Ritz A.R., Tsarev V.
Decisions on the layout of the tank are described in the publications of E. A. Morozov, A. I. Mazurenko, P. I. Nazarenko, and others in the journal Bulletin of Armored Vehicles. See (in Russian) – Problem of weight limitation of the modern tank, Ways to improve the survivability of a tank, One of the ways to improve the reliability of the tank arms complex, The problems of development of observation means of a tank driver. An important principle implemented in this project is the division of the entire vehicle into compartments isolated from each other. The first is the fuel compartment, divided by several partitions into sections to prevent significant loss of fuel when armor is penetrated, with the minimum acceptable level of armor protection (100 mm / 68 °) from the most common anti-tank weapon types. Damage to this compartment and partial loss of fuel in battle will not lead to the loss of its tank combat capability. Behind it in the center of the tank a crew compartment is located, protected by the main composite armor (500 mm) and shielded by the armor of the front hull assembly and fuel. In this case, the fuel serves as a "filler" of the composite armor, see – Diesel fuel as a filler of composite armor (in Russian). Protection of the frontal projection of the turret had a LOS of 780 mm (at a firing angle of 30°). Side protection - 300 mm. Hull sides had 180 mm thick composite armor array with side skirts (power screens) of 85 mm. The bottom of the location of the crew capsule was equipped with a combined protection. The tank was originally designed taking into account the installation of the APS created under the "Standard" reseaarch theme. In the second version, the APS mortars were installed around the perimeter of the hull, six on each side. APS provided azimuth protection of ± 150°. From the ammunition attacking from above, the tank was defended by 6 mortars installed in the side niches on the stern of the sides of the turret (3 on each side of the turret). On the third version of the layout, the APS installation scheme has been changed. To protect tank from the top and side attacks, mortars with protective charges of smaller dimensions were used, primarily to intercept the ATGM and RPG. In the later version, it was also planned to install the “Shtora” electro-optical countermeasure system on the tank. Development of a future APS delayed and its installation was carried out on the first prototype of the Объект 195 "Т-95" (ОАО "УКБТМ"). The length of the tank hull - 6790 mm. Overall length with gun facing forward – 9150 mm. Height up to turret top – 1890 mm (variable). Width (including side skirts) – 3450 mm. It is necessary to pay special attention to the overall dimensions of the tank and first of all to its height, which could be changed due to the hydropneumatic suspension. The effect of height is well known. On the one hand, this is the probability of detection and the first shot in a duel battle, and on the other - the greatest contribution to the mass of the tank. According to the data of the Armor Academy named after R. Ya. 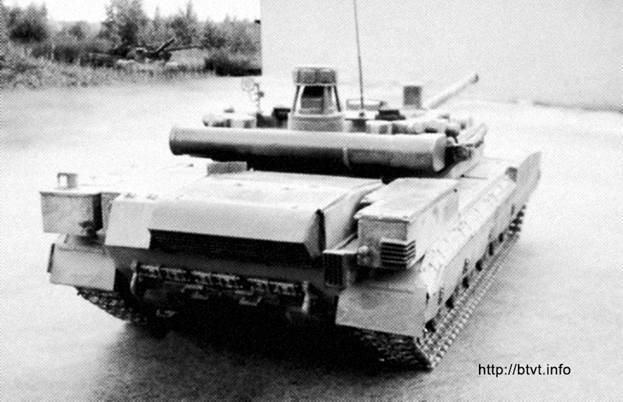 Malinovsky, reducing the height of the tank from 2,400 to 1,600 mm at a speed of about 40 km/h reduces the likelihood of its hitting by half. At the same time, the weight gain due to each millimeter height of the tank with a modern protection technologies level is 15-20 kg, and a mass of 1 mm of length is only 2-3 kg. Thus, it is necessary to look for ways to reduce the height of the tank reasonably, compensating for the volume by lengthening it. This will also increase the number of suspensions and the length of the supporting surface, compensating for the increase in weight by increasing the elasticity of the suspension and reducing the average ground pressure. On the other hand, in the variant EA Morozov there are drawbacks. Quote: 07/07/81. Shomin (head of KMDB) held a meeting on a future tank, there were Anishchenko, Potemkin, Borisyuk, Maresyev, Ryazantsev, Kovalyukh, Mazurenko, Baisov and me. Again we considered two options for the tank. From the very beginning it was obvious that Shomin was betting on the Kovalyukh’s variant. After both reports, he began to criticize the option of Morozov - a low line of sight and the possibility of sticking a cannon into the ground, a new motor-transmission compartment and an engine, two-man crew. Kovalyukha’s option was basically supported and, apparently, he decided to accept this option. Running model for testing hydropneumatic suspension of “Object 490” called “Grasshopper”. Note that hydropneumatic suspension is protected against small gun fire, shrapnel and dirt by protective screens. The “490” of Evgeny Morozov differed from the “internal” competitors being developed in the same period by the small size of the frontal projection. 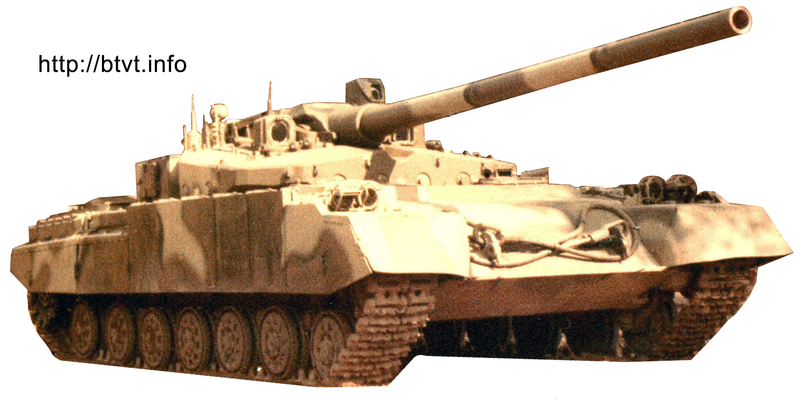 If adopted as a main development project the “477” could compete in size with the "Abrams" and "Merkava", the "490" in the frontal projection was smaller than serial tanks. Quote from Yu. M. Apukhtin’s book: 04/04/87. I do not know what will happen next, but so far we have lost the traditions of Morozov, we rushed to do everything to the maximum and fulfill all the requirements, while losing the being. We all need to think a lot and look for original solutions for the tank. 125 mm gun of increased power (130 mm variants were considered). In the original version, the automatic loader was placed in an isolated autonomous compartment behind the tank turret, an additional body conveyor was placed in an isolated compartment between the combat and engine compartment. The allowable length of the projectile was 800 mm, the length of the charge - 550 mm. In the automatic loader placed behind the turret (on the tank number 1 and number 2 versions), shots with a length of up to 1,400 mm were allowed, including unitary ones. On subsequent version with a double-flow automatic loader with separate loading rounds was proposed. The projectile and charge were placed in turret bustle and hull sequentially (… round-charge-round …). The automatic loader had an electrical backup system without manual backup. Overall “490” tank had very simple and efficient autoloader design. Such autoloader design is used on serial produced tanks like “Leclerc”, K-2, type 90 and others. Ammunition in the tank was isolated from the crew. To neutralize the high pressures arising in the case of detonation of charges, “blow-off plates” (See. 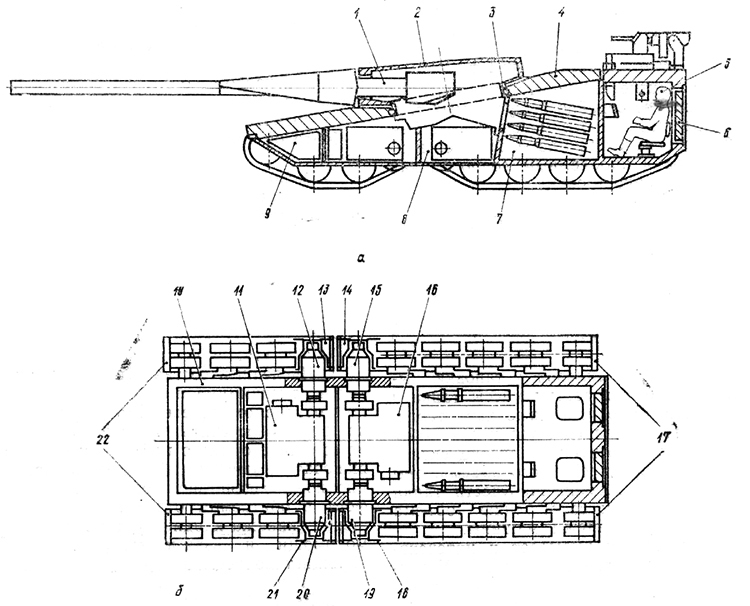 – Armored compartments for tank munitions) were are provided in the roof of the hull compartment above the hull autoloader and in the bottom and roof of the turret bustle compartment. Additional armament consisted of a machine gun coaxial with a cannon and two anti-aircraft machine guns placed along the sides of the aft part of the turret. Also options for installation of 23 or 30-mm automatic gun were under consideration (casing on the right side of the turret, variant 3). The final version of the additional weapons has no final decision. The sighting system was to consist of two panoramic daylight sights and a thermal-television panoramic sight, which was placed independently with remote transmission of information from it to the crew monitors. The auxilary sight with a light-fiber connection was mounted in the gun mask. Quote: 28.01–2.02.80. I was back to the Central design bureau KMZ, where they had already considered their more specific proposals on the complex. At all levels, up to Nekrasov, they surprisingly welcome to work with us. At the suggestion of Mazurenko, based on the layout for two people, the aiming complex should consist of two panoramas without a night channel, the passive night sight was placed independently. Based on the requirements of the crew accommodation, the devices should be without optical eyepieces, which looks too revolutionary and is it possible to create such a device? Replenishment of ammunition of "490" variant 2 tank with the help of armored refueling and reloading machine. The vehicle was designed to quickly refuel and rearm a tank in any situation, if necessary in combat, without the crews getting outside. During the rearming the autonomous autoloader module has to be replaced. This solution required the placement of all autoloader drives in a removable module. BZZM could provide replenishment of ammunition for 5 tanks, the vechicle also carried up to 5 tons of fuel and the volume of 1000 liters of cartridges rations and spare parts. Delivery of ammunition and fuel is made by army all-terrain vehicles with, and therefore the replenishment of the tank with ammunition on the battlefield is difficult due to insufficient off-road mobility and protection of supply vehicles. It is worth noting that the battlefield of the 80s was not conceived without the massive use of tactical nuclear ammunition, while the full-fledged functioning of vehicles in conditions of radioactive contamination was impossible, which could significantly restrict the use of tanks. This problem can be solved by creating a special tracked vehicle. It is advisable to use same vehicle for refueling and reloading ammunition. Armored refueling vehicle (BZZM) should be unified on the chassis with a tank. A cargo platform can be installed on the BZZM chassis, on the inner walls of which there is a niche with ammunition containers placed inside. For the movement of ammunition containers (autoloader modules) from the niche to the swivel frame and the loading of ammunition into tank driving mechanisms are installed. Along the perimeter of the frame a fuel line is fixed with a swivel. At the output ends of the fuel line docking devices connecting the fuel tanks of BZZM with the filling neck of the tank are installed. It should be possible to refuel and reload without crews leaving their vehicles. Understanding this situation, as well as trying to reduce the likelihood of heavy damage to tanks, even in the case of isolated placement of fuel and ammunition, it was proposed to create an armored refueling and rearming vehicle (BZZM) based on “Object 490” chassis. According to preliminary estimates, while providing the machine with the necessary energy sources, it is possible to fill one tank with fuel in 2 minutes, and reload a full mechanized ammunition load - in 5 minutes. The transportable stock of ammunition and fuel, which can be implemented on the BZZM in acceptable weight and size characteristics, is sufficient to completely refuel five tanks. 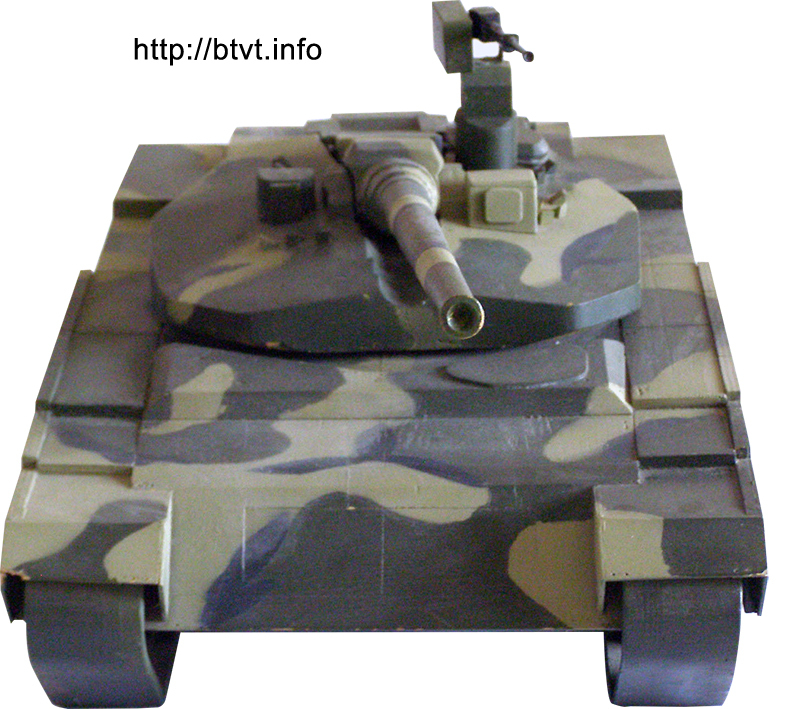 BZZM is capable of accompanying a tank in the same combat line, overcoming natural and artificial obstacles, passing through contaminated areas of the terrain, and operating under conditions of use of nuclear weapons. The wooden model of the tank is 1:10. Late version ~ 1986-1987. The tank was equipped with a 6TD engine (6TDF) with hydrostatic transmission. 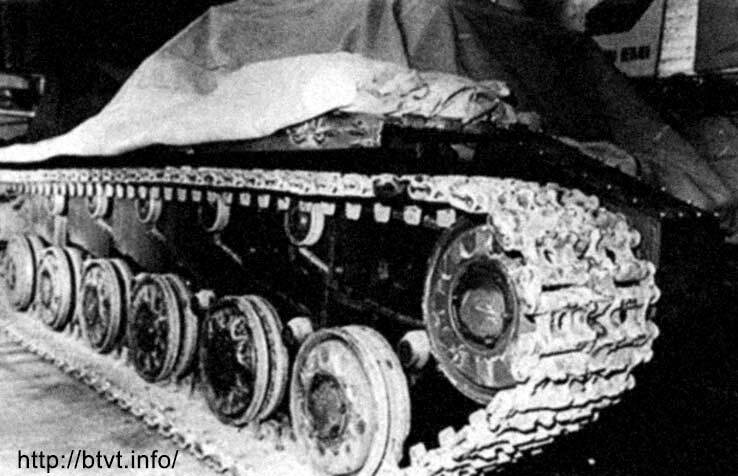 The running gear was partially adopted from T-64 tank (road wheels), the track with 580-mm width were used. It is also worth mentioning that after creating a version of a tank with a crew of 2 man, a version of a tank with a 3-man crew was created, in which the driver was placed reclined. In October 1984. The leadership of the GBTU (main armor department) and the GRAU (main artillery and missile department) arrived at KMDB, headed by general Potapov and Bazhenov to watch the progress of future tank development. The attitude of the military to the vehicle was wary and Bazhenov was biased towards everything. Shomin reported about the tank development, began a stormy debate, what caliber should be choosen. On the “490A” a 130mm caliber gun was installed and talks about increasing the caliber continued for a long ago. Disputes began which caliber to chose – 140 mm or 152mm. At that moment, General Litvinenko, the head of NTK GRAU (Scientific committee of main artillery and missile department) , made the a diagram very well and clearly, and literally in three minutes proved how effective the 152 mm caliber is for the tank. From this point on, the 152mm caliber was adopted for the future tank project and nobody ever returned to this issue. Test rig of the “Object 490A” tank code named “Rabel”. At the of 1984 the final decisions to use 152 mm for future tank was made. After the decisions to use 152 mm for future tank was made the “490A” development was abandoned and a new design, the result of which was the creation of “477” tank which received a name “Molot” (Hummer). The Morozov’s “490” project was in development parallel to “Molot” and also was redesigned to be equipped with a 152 mm 2A73 gun. This led to the creation of one of the most unusual tanks in the history of tank building, distinguished by unparalleled levels of crew protection, mobility and firepower.